The Armada Portrait of Queen Elizabeth I on display on May 23, 2016 in London, England. A rare 16th century portrait of Queen Elizabeth I will become public property after a donations appeal raised 10 million pounds ($13 million) to keep it in Britain. 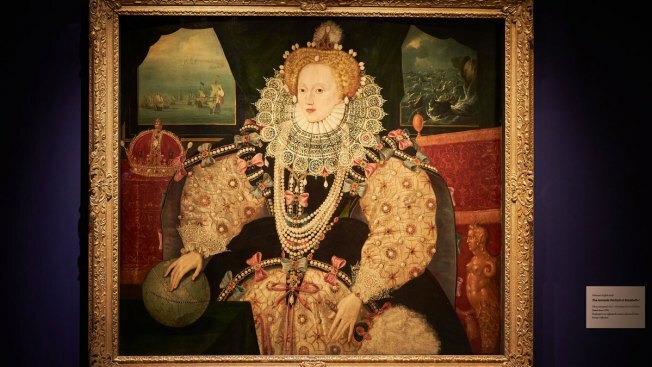 The "Armada Portrait" commemorates England's 1588 triumph over an invading Spanish armada. It shows the queen in a bejeweled dress with her hand resting on a globe. Behind her, the Spanish fleet is wrecked in a storm. The painting — one of three copies to survive by an unknown artist — was owned by descendants of sailor Francis Drake, who decided to sell it. The appeal drew 1.5 million pounds in public donations, and millions more from charities and arts funds. The painting will be displayed inside the Queen's House on the site of the former Greenwich Palace, Elizabeth's 1533 birthplace.